After harvesting his swamp in December or early January, the farmer must select a site for his new farm. To show the boundary, he brushes patches and marks each with a split bush pole. A leaf stuck in the top of the stick warns other farmers that the ground is spoken for. 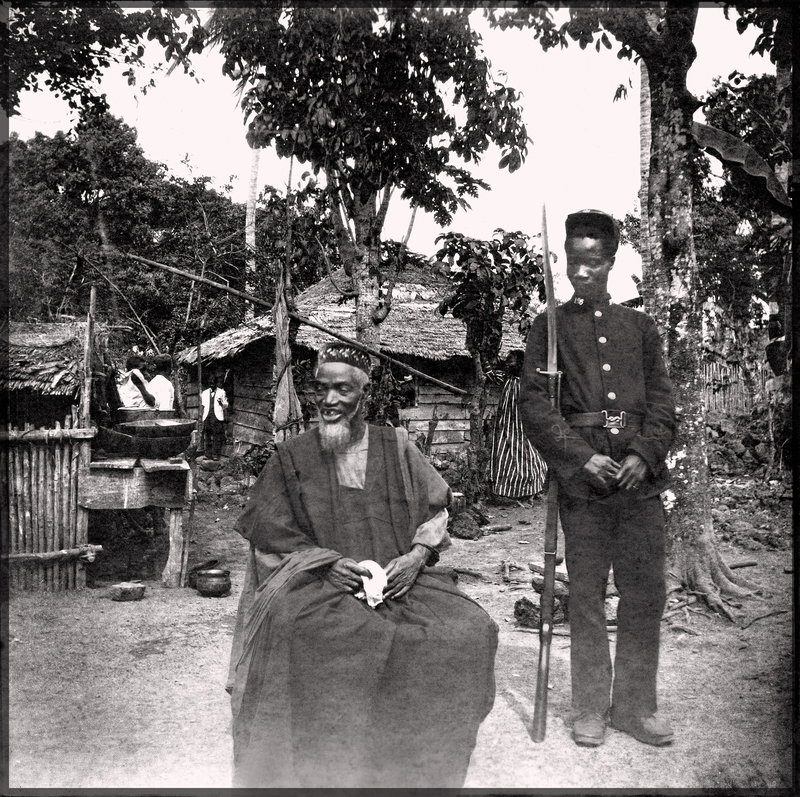 At this time, the farmer may consult a sorcerer ("looking-gron man," in Krio) to determine whether the place he has chosen is suitable for farming. In some places farms are prohibited; in others, bad devils (or even good ones) are found in possession of the bush and must first be placated. In the latter case, the sorcerer may prescribe yaasi (sacrifice), such as rice flour, or the suspending of a bell from a frame on a cord of white satin. Or, he may recommend fangadama: "whatever you have"—”rice, cassava, banana, bush yams, etc. A place to make the sacrifice will be designated, usually in a valley, near a tree, on the farm path, or near a big stream. The farmer may also be warned in a dream. Brushing, then at the end of March, felling of trees. Now there are certain signs which can let a farmer know whether he is on schedule. While he is brushing, he will look for the first rain, fiamakכεsכna, "the rain which washes the bush." When the ground is soaked, the termites, which come out three times a year, make their first appearance. Farmers call them fiach bii, "brushing termites." 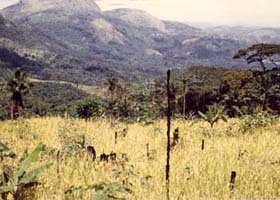 While felling the trees on his farm, he expects a second rain, kכntεsכna, and the termites come out for the second time. They are now called kכntebii, "felling termites." If the farmer has not reached the stage of work which coincides with the appropriate arrival of the termites, then he knows he is running behind. After one rain, or when the farmer notices the weather beginning to change, the farm is burned. Then the termites come out for the third and last time. Now they are called snmindabiinu, and any man who hasn't burned his farm has cause to be worried: The rains will be falling three times a week now, and his farm may not burn properly. The rice is broadcast on the farm. The rice seed may be mixed with corn, okra, small beans, cotton, benne, and cucumber seeds. The women weed the rice while the men fence the farm to keep out the cutting-grass (cane rat), which by this time will be smelling the young rice plants. Cut sticks for the platform, kpasa and drive birds off the rice. The harvest. 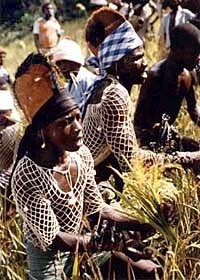 The first soft rice harvested is beaten to make flour gbafu and is set out for the farm's devils. If there is a senjε tree (associated with devils) on the farm, the rice flour will be wrapped in a leaf and put underneath it; otherwise, it will be put under the kunduasen (or baeasasen), the stone where the farm's machetes are sharpened: It is believed that this stone contains a devil. Some of the rice flour is scattered on the ground for visiting devils — ”the bad ones who didn't help the farm. 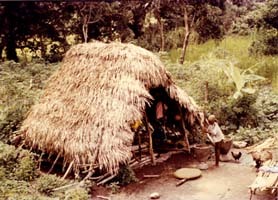 In the evening, rice flour is set out inside the door of the house (if the ceremony is performed by a man), or near the family's drinking water (if it is performed by a woman). Beaten rice is also offered, and the family calls on their ancestors and deceased parents by name: "Call the ones I don't know, along with your friends, and come in the morning." The ancestors are asked the insure the family's good health, to prevent discord, and to protect family members from accidents. In the morning the rice is cooked for them, and after several hours it is eaten by the youngest children. The basin is washed by hand, and the remaining grains of rice are scattered throughout the house. 3 bofadכndכ (handfuls) make one kandadכndכ. 10 kכchidכndכ make one sככdכndכ, or kכchitanε, which equals 30 or more pans of beaten rice. When relatives come for rice, it is customary to give them kandafea (two-thirds of a tie), or kכchidכndכ; rarely will they leave with sככdכndכ. The rice is stored by sככdכndכ; a small farm may produce thirty or fifty of these, a large farm up to 100. After the rice has been bundled and counted, it is locked into the rice barn. The key is held by the favorite (senior) wife so that she can take out the rice as needed. If the man does not trust her, he can keep the key himself, and ration the rice out to her as she needs it to cook.